The Free Speech Movement at UC Berkeley began its fight for free and open discourse in 1964. As the fiftieth anniversary of this movement draws near, its legacy of openness and the right to seek, receive, and impart information endures. As we consider the importance of open discourse and open access to information, we ask that you join us in opening up and engaging with historic materials about this milestone moment at Berkeley in a new, innovative way. From April 1 - 12, 2014, help us hack the Free Speech Movement Digital Archive at HackFSM! HackFSM will be an opportunity to dig into the data of the Free Speech Movement Digital Archive and work with it directly. This culture of building, playing, and "hacking as a way of knowing" is a crucial part of the innovative spirit of the Digital Humanities. The idea that one can acquire a deeper understanding of tools, technologies, platforms, information, and systems through development is a principle that surrounds this event. Furthermore, this event seeks to bring students together from all disciplines to work collaboratively and creatively to give back to their campus community through the Free Speech Movement Digital Archive. 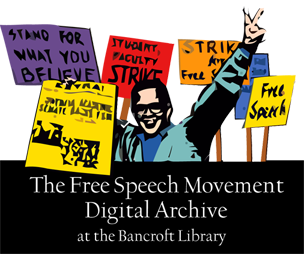 The goal of the HackFSM hackathon is to develop a compelling user interface for the digital images and texts related to the Free Speech Movement that the Bancroft Library is making available through an API. Teams of up to four students will develop a web interface for research into the digital archive (see Contest Requirements for details). The application should address issues of humanistic scholarship, and show applicability and adaptability to a range of projects and scholarly fields. Please review the Contest Requirements and Guidelines, and then register for HackFSM! Questions? Please contact the organizers. HackFSM is a Digital Humanities @ Berkeley initiative run by the Bancroft Library, with support from the Office of the Dean of Arts and Humanities, the Office of the CIO, and the I-School. #HackFSM was a one-time event held in April 2014. The winning site is now available. A white paper on #HackFSM has also been published, with practical information for other libraries that are interested in holding hackathons.